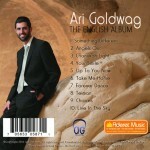 We have to remember, aside from being a musician/singer, Ari Goldwag is also a Kiruv Rabbi (www.arigoldwag.com) who provides the listener/viewer with a purpose and message behind every song/drasha. 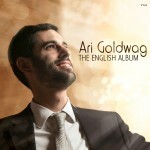 With that prior knowledge, it makes sense that he finally released a album full of English tracks. Each track is like a mashal (parable) which provides the listener with not just a song, but a lesson. We’ve had sprinkles of Ari’s English songs before; most recently on Am Echad which featured “Don’t Be Shy to Say the words”, “Hashem is always there” and “Yosef”. They were all terrific songs, which is what excited me about the release of an album dedicated entirely to his English compositions. Without further ado, let’s analyze this album. This opener has a great sound to it. It has a soft pop sound and gets the blood pumping; great song for a jog. The lyrics are fantastic and well written. If I’m interpreting the message correctly, the song is about seeing beyond the mundane and finding Hashem in everything which will help you “escape from your sadness” and see the purpose in everything. Angels Out has a very calming and soothing sound which serenades the listener. The angels the song is referring to are the Shabbos angels that come every shabbos to visit. At one point in the song “Shalom Aleicheim” which is recited every Friday night before Kiddush is recited. Ari’s son Moshe Dov makes an appearance in this song with background vocals which adds a befitting father & son touch to this song. I’m missing something, because I do not have the booklet, so I don’t know who he is singing about in this song. However, this song is beyond gorgeous – a very well done ballad. At first I didn’t like the sound behind this song, but it has grown on me. It’s definitely not my favorite on the album; I don’t think there’s a lot of depth behind it, but it’s a nice soothing listen. Again, I don’t have the booklet so I don’t know if this is an original composition, but it sounds like something out of a Disney movie. It’s a beautiful song and I keep coming back to it, again and again. This may be the best song on the album. There’s something electrifying about this composition and Moshe Dov’s (Ari’s son) vocals. He doesn’t blow you away by any means but his voice has an addictive sound to it. I’m not a huge fan of these tracks and the album fizzles out for me here. I’m sure other people will like them but the sound behind them is not to my particular taste. Track 1-7 are worth the album themselves. No point on paying $7 for them when you can pay $10 and take a chance on the last 3 songs that you may like.